Personal computer history doesn’t begin with IBM or Microsoft, although Microsoft was an early participant in the fledgling PC industry. The first personal computers, introduced in 1975, came as kits: The MITS Altair 8800, followed by the IMSAI 8080, an Altair clone. (Yes, cloning has been around that long!) Both used the Intel 8080 CPU. That was also the year Zilog created the Z-80 processor and MOS Technology produced the 6502. Bill Gates and Paul Allen wrote a BASIC compiler for the Altair and formed Micro-soft. In 1976, Apple’s two Steves (Jobs and Wozniak) designed the Apple I, Apple’s only “kit” computer (you had to add a keyboard, power supply, and enclosure to the assembled motherboard), around the 6502 processor. That was also the year that Electric Pencil, the first word processing program, and Adventure, the first text adventure for microcomputers, were released. Shugart introduced the 5.25″ floppy drive; it would become a key component in the personal computing revolution. 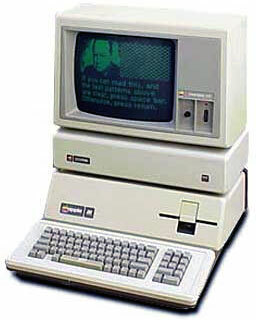 The young industry exploded in 1977 as Apple introduced the Apple II, a color computer with expansion slots and floppy drive support; Radio Shack rolled out the TRS-80 to its stores across the nation; Commodore tapped into the pet rock craze with its PET; Digital Research released CP/M, the 8-bit operating system that provided the template for MS-DOS; and the first ComputerLand franchise store (then Computer Shack) opened. Software took center stage in 1978 when Dan Bricklin and Bob Frankston produced VisiCalc, the first electronic spreadsheet. This turned the personal computer into a useful business tool, not just a game machine or replacement for the electric typewriter. WordMaster, soon to become WordStar, was released and went on to dominate the word processing industry for years. Atari leveraged its video game experience and household name to enter the personal computing market, and Epson shipped the TX-80, the first low-cost dot matrix printer. The third important software category, the database, blasted onto the scene in 1979 with Vulcan, the predecessor of dBase II and it’s successors. That was also the year Hayes introduced a 300 bps modem and established telecommunication as an aspect of personal computing. Texas Instrument’s poorly designed and ill-fated TI-99/4 also shipping in 1979 as the personal computer industry’s first 16-bit computer. It was hobbled by an 8-bit bus for memory and peripherals, which slowed memory access significantly. 1980 was the year Commodore opened the floodgates of home computing with the $299 VIC-20. Sinclair tried to one-up them with a $199 kit computer, the ZX80, which was quite popular in Britain, but it was destined to remain a bit player in the PC industry. The same can be said of Radio Shack’s fairly impressive TRS-80 Color Computer, which suffered primarily from complete incompatibility with its existing TRS-80 line. Apple III with 5 MB ProDrive hard drive. Yet another 1980 disaster was the Apple III, which shipped with 128 KB of memory, an internal floppy drive, and Apple II emulation. Alas, it just didn’t work right, forcing Apple to recall them all, fix a number of problems, and rerelease the Apple III some time later with 192 KB of RAM. This was also Apple’s first computer to support a hard drive, the 5 MB Profile. Estimates are that there were one million personal computers in the US in 1980. In early 1981, Adam Osborne introduced the first portable computer. The Osborne 1 was about this size of a suitcase, ran CP/M, included a pair of 5.25″ floppies, and had a tiny 5″ display. The innovative machine was bundled with about $1,500-2,000 worth of software, and the whole package sold for $1,899. The first laptop computer also arrived in 1981, the Epson HX-20 (a.k.a. Geneva). The HX-20 was about 8.5″ by 11″ and maybe 1.5-2″ thick and used a microcassette to store data. It displayed 4 lines of 20 characters on an LCD screen above the keyboard. 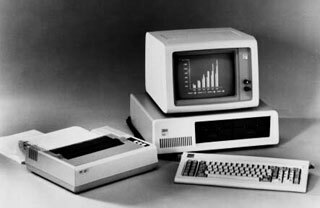 Of course, the most significant event of 1981 for the personal computing industry was the introduction of the IBM PC on August 12. This computer ran a 16-bit CPU on an 8-bit bus (the Intel 8088), had five expansion slots, included at least 16 KB of RAM, and had two full-height 5.25″ drive bays. Buyers could get a fairly loaded machine with a floppy controller, two floppy drives, a monochrome display adapter and 720 x 350 pixel green screen monitor, a color display adapter and CGA (320 x 200 with 4 colors or 640 x 200 with 2) monitor, a parallel card, a dot matrix printer, and an operating system – with the choice of CP/M-86, the UCSD p-System, or PC-DOS (a.k.a. MS-DOS). Pretty much everything was an option, and everyone recognized that the IBM PC was based on ideas perfected in the Apple II, particularly general use expansion slots. The second most significant event of 1981 was dependent on the first: Microsoft got IBM to agree that PC-DOS would not be an IBM exclusive. This paved the way for the clone industry, which in the end marginalized the influence of Big Blue. Time magazine called 1982 “The Year of the Computer” as the industry grew up. By 1983, the industry estimated that 10 million PCs* were in use in the United States alone. * Ever since IBM entered the market, the term PC has taken on a different meaning. Although it retains the original meaning of “personal computer”, the IBM architecture has so dominated the industry that it soon came to mean IBM compatible computers to the exclusion of other machines. 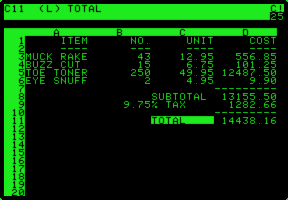 VisiCalc met its match in 1983 when Lotus 1-2-3 shipped for the IBM PC. That was also the year that Microsoft Word 1.0 shipped, although it remained a small player until Windows dominated the PC world. Apple introduced the first consumer machine with a mouse and graphical user interface, the Lisa. Of course, at $10,000, not many consumers or businesses could afford it, but it paved the way for the Apple Macintosh of 1984. At $2,500, it was much more affordable than the Lisa. IBM took the PC beyond the 8-bit bus when it introduced the AT (for Advanced Technology), a 6 MHz 80286-based computer with a 16-bit bus, high density 5.25″ floppies, and a new video standard, EGA.